For those who live in wooded areas with fallen or cut trees, transforming tree trunks into something decorative and eye-catching is a wonderful way to repurpose unused wood. 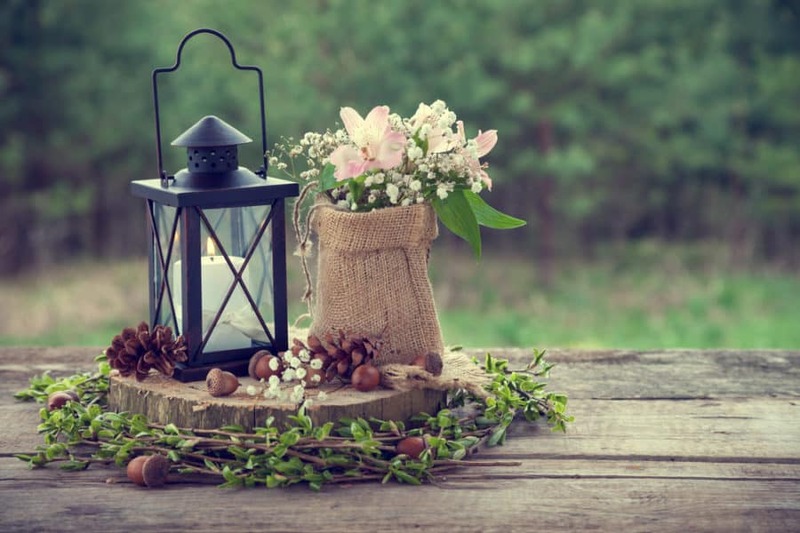 Adorning tree stumps with dainty items or reshaping the wood into a spectacular image can add a rustic look to your yard and increase the cuteness, and uniqueness of your outdoor space. In this article, we’ve decided to list 21 of our absolute favorite tree stump ideas to get your creative DIY juices flowing! Our first (and featured) tree stump idea is this beautiful wedding decor. 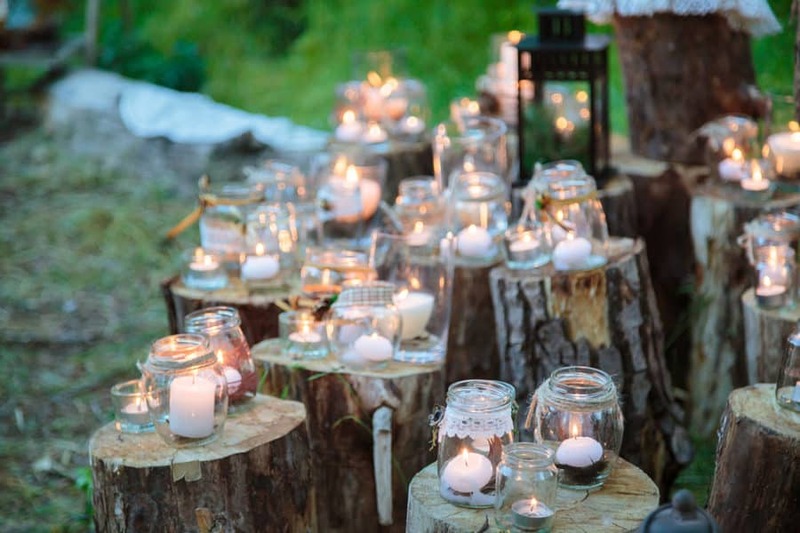 The natural appearance of the tree stumps, the soft glow of the candles inside glass jars, and delicate white lace create the perfect rural scenery for the evening of your special day. Before we say anything else, we sincerely hope you caught our pun in the subtitle. Now, the countryside feeling that this decor brings is likely unable to be matched. 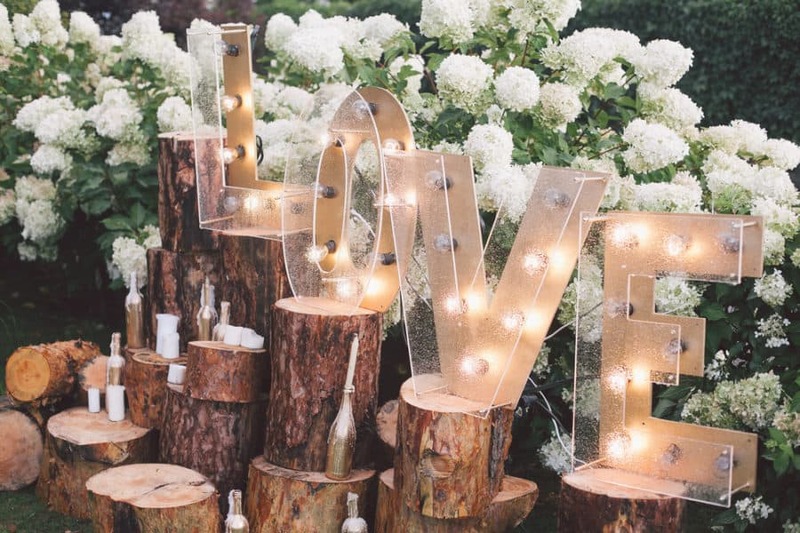 With the melted and bottled candles, rustic stacked tree stumps, white flowering shrubs, and glamorous Hollywood-style lit-up letters spelling “Love” we doubt you could get any more countrified than this (which isn’t a bad thing). Though this decor isn’t made with an entire tree stump, sawing off multiple small table decor bases from one large stump is a wonderful idea. The stick wreath with leaves and acorns really enhances the natural aura of this centerpiece. Additionally, the candlelit metal lamp and burlap sac holding dainty flowers give off an old-timey, homegrown feel. 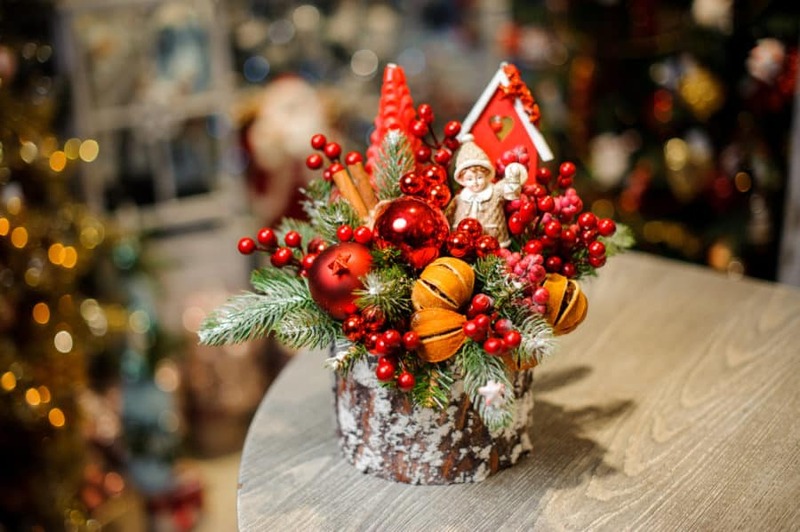 This Christmas table decoration made with a tree stump base, fake berries, pine needles, and dried orange peels gives off the perfect homey holiday vibe. The Christmas colors, adorable tiny home, and the little girl dressed in winter attire all harmonize to make a beautiful table piece that is sure to warm the hearts of your guests on cold, snowy nights. This tree stump dinner mat isn’t really a mat per se… but, it without a doubt makes a unique and Christmas-themed addition to your dinner table. Your dinner guests are sure to enjoy the Holly wreath, the scent of pine, and delicate sprinkles of gleaming fake snow as you talk and eat together. There’s no doubt your party will be a hit with this decoration! This holiday centerpiece is simple, as to not take away from surrounding decorations, yet effective enough to bring a room together. 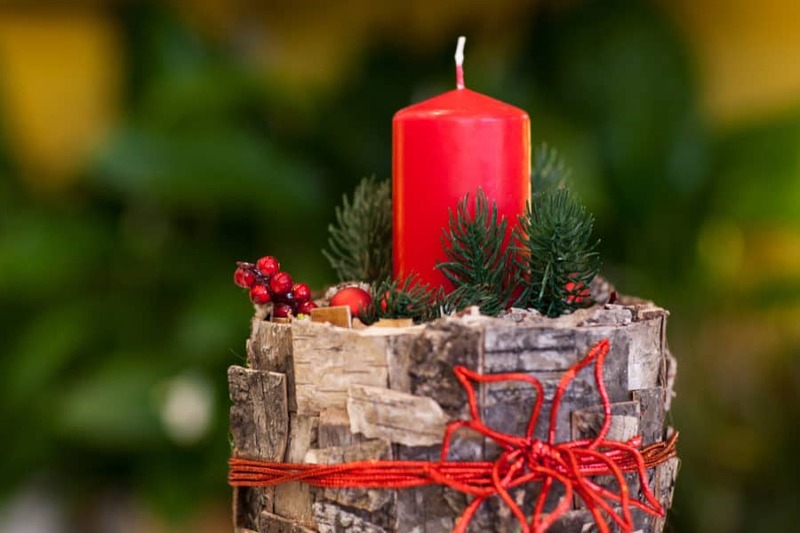 The uncomplex red candle, few pine needs, and minimal red ornaments bring a tad bit of color to the room as they sit upon the winter appearance of the wood stump. The shimmery wire wrapped into the shape of a Poinsettia is truly the cherry on top of this table piece. The table and chairs shown above in the photo were crafted out of very large tree stumps. The table stump was fashioned in such a way to make the tabletop broader, with a skinnier base for more leg room. The chair stumps were simply cut and smoothed at an angle to create backs and a seat. This would make a wonderful DIY project for the crafty minded and blend perfectly into the natural scenery outside of the home. 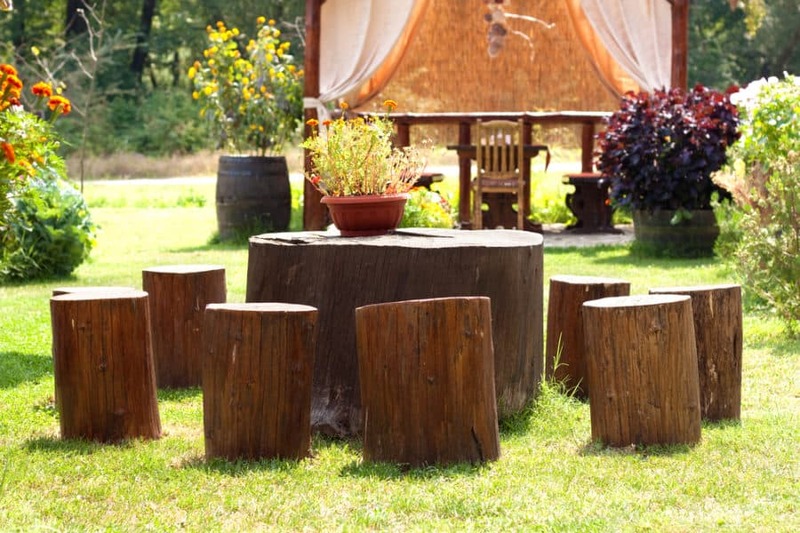 Perhaps the easiest project (if you’re a DIY crafter) and simplest design on our list, this cylindrical set of smoothed-down tree stump seats and enormous tree stump table bring about a campfire aura to any backyard they’re in. Similar to the tree stump table and stool set in the last idea example, this set is cylindrical and simple. However, if you haven’t already noticed, the difference lies in the bright, popping colors of the top half of the tree stumps. 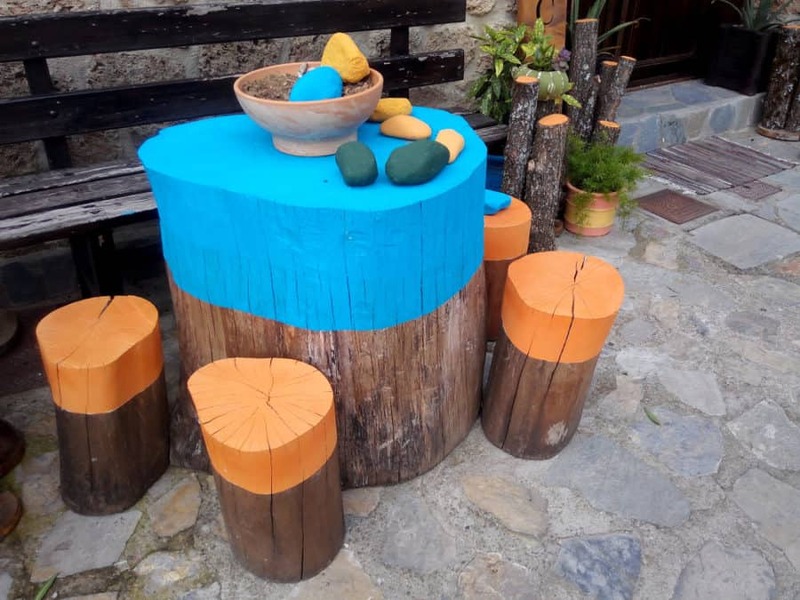 Painting part (or the entirety) of tree stump tables and stools is a unique and cost-effective way to bring some color and customization to your backyard. 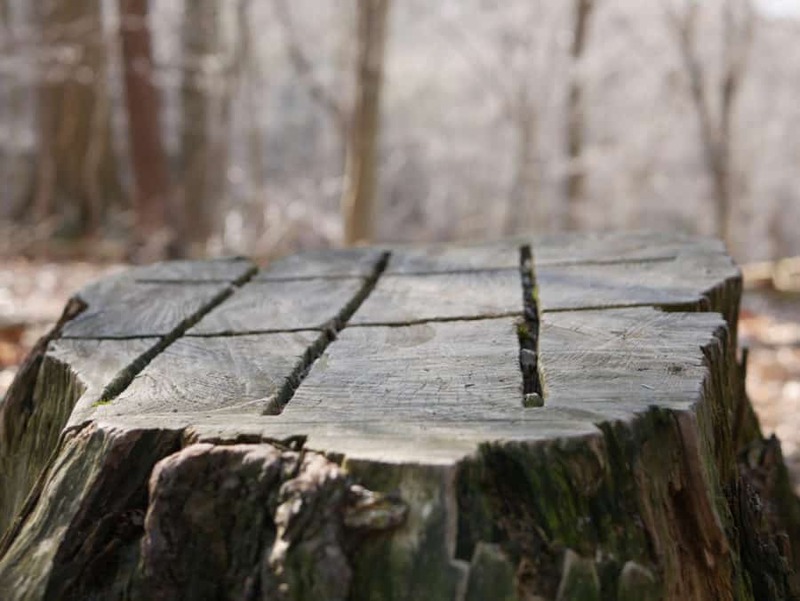 If you like playing tic-tac-toe, this tic-tac-toe table made out of a smoothed-down tree stump would be a fun way to put your fallen trees to use. Though it wouldn’t save much, this idea would at least save some money, keeping you from having to buy anything but chalk to draw your X’s and O’s with. 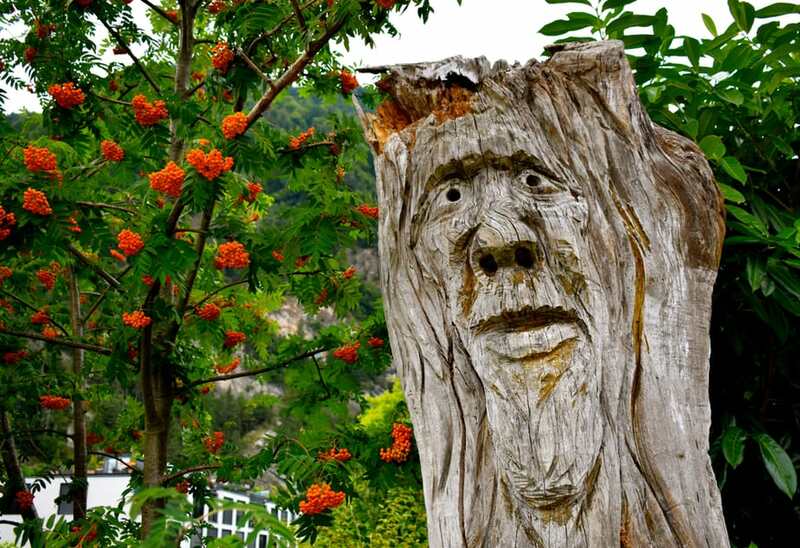 If you’re a fan of the foresty Scandinavian tales of giants in the trees, this gigantic face in the tree stump would bring folklore to life in your backyard. The almost seamless appearance of this carving makes this tree stump look naturally mythical as if the tree were actually a being come to exist right out of the whispers of Scandinavian lore. The rough cutout of this little bird figure is adorable and storybook-like in its own right. Painting it in realistic colors would be enough to bring a bit of joy to your yard with the exaggerated features of this woodland – wooden – creature. 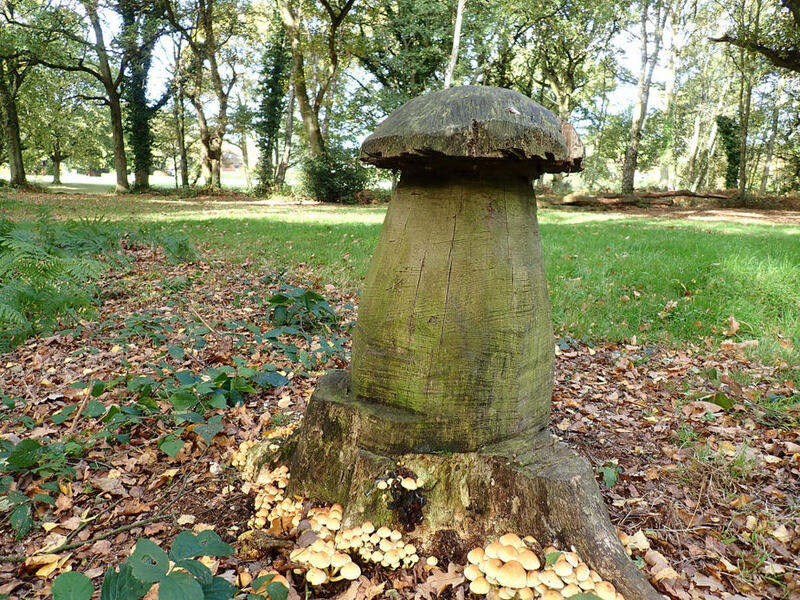 Yet another woodland addition to any yard, this oversized toadstool carving brings about an air of fairytale wonder. We think this carving would be magical with or without paint, but of course, the outcome is entirely up to your inventive imagination. This wooden heart is a wonderfully delicate expression of love. 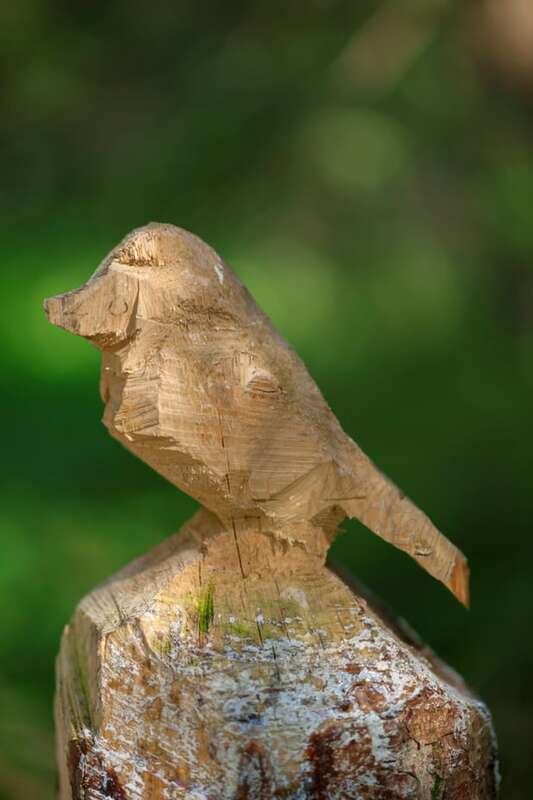 A carving like this is sure to add an aura of warmth and affection to your backyard and can be easily constructed using a chainsaw (if your chainsaw chain isn’t dull, that is). 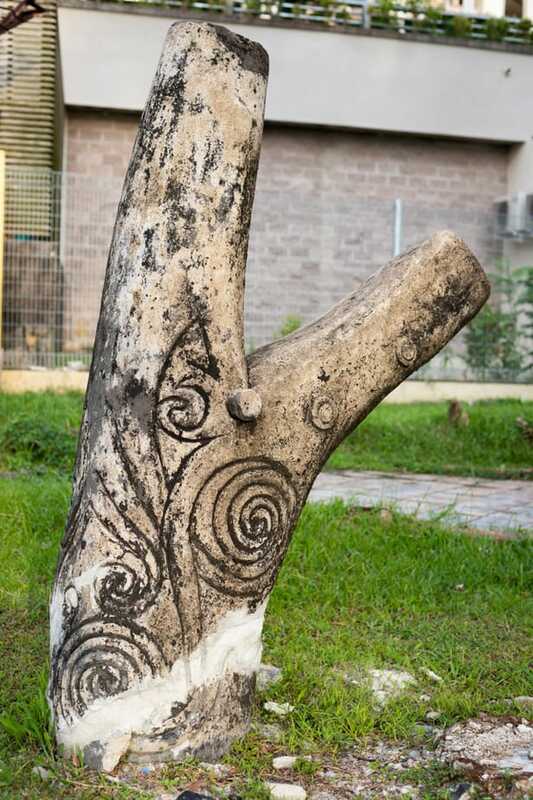 For the abstract in you, this tree stump with variously sized and shaped swirls is one of the simplest yet eye-catching DIY artistic expressions we could find. There’s something about tiny wooden houses, exaggerated wooden birds and toadstools that bring a sense of fairytale enchantment to backyards. This carved wooden house complete with a door, window, roof, and chimney crown makes it seem as if a tiny winged fairy could walk outside at any moment. 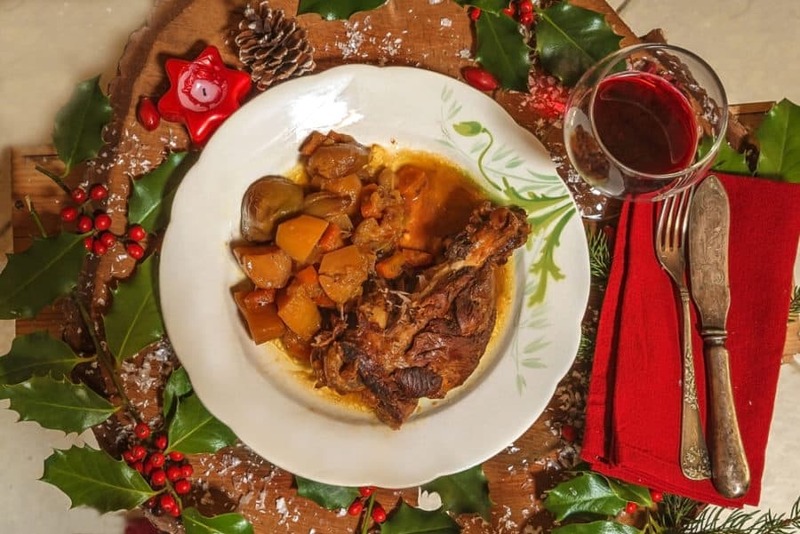 We all (well some of us anyway) remember the childhood stories of the witty, old owl from Winnie The Pooh or Big Mama, the mother owl with a whole bunch of love to give from the beloved film The Fox and the Hound. It’s characters such as these that bring the wise, caring fictional feeling of owls to life, and this carved wooden owl perfectly encompasses this sentiment of boy and girlhood. Cutting down a tree for Christmas has been a holiday tradition for (surely) as long as any of us can remember. 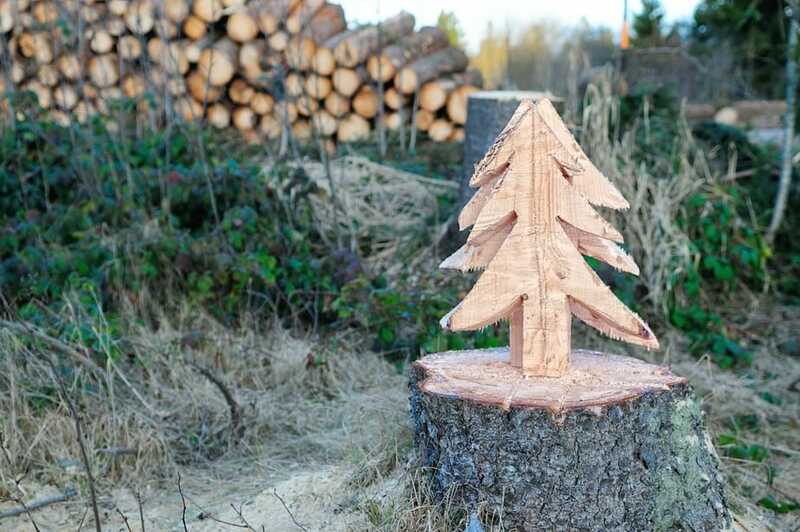 If you’ve grown your own Christmas trees or have gone to cut one down from a tree farm, sawing a cartoon-style Christmas tree into the trunk of an actual tree is a clever way to make use of the stump. 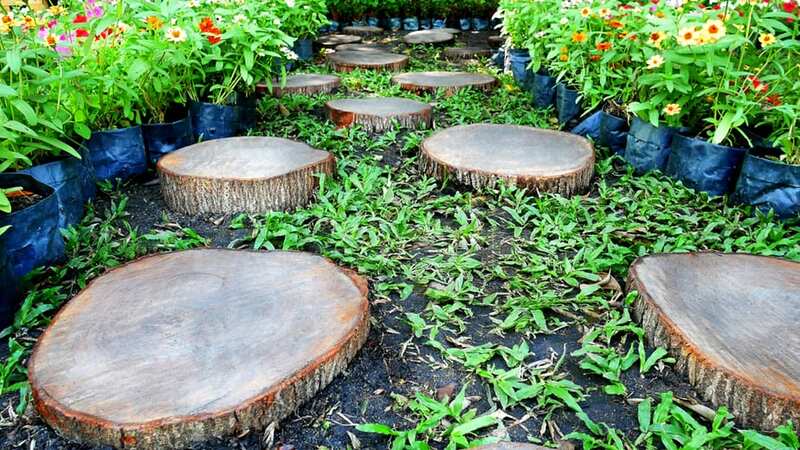 For narrow grass or dirt paths, this single stump walkway is a unique way to reuse cut down trees. A little walkway like this would be perfect for keeping your shoes clean (or more clean than usual) as you walk from different areas of your property. Not to mention, tree stump walkways are much more cost effective than stone walkways. 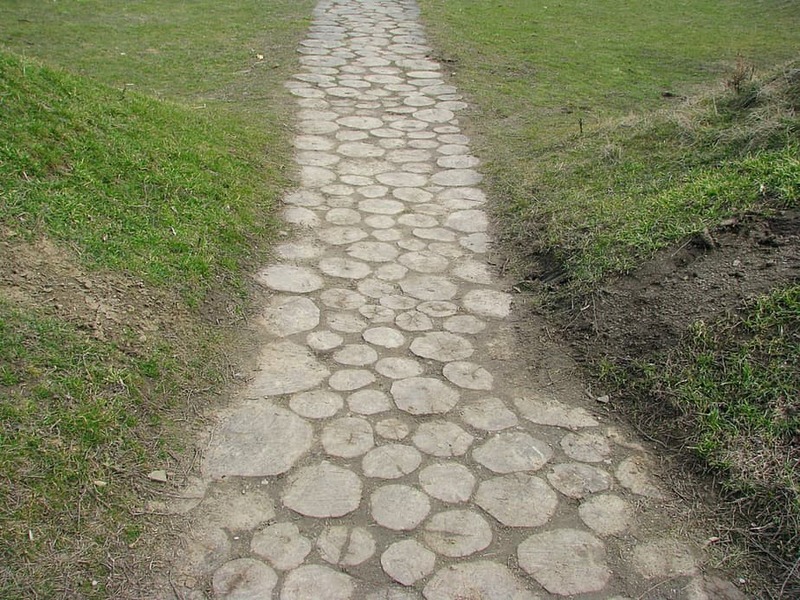 This walkway made of – likely hundreds – of tree stumps creates a vague illusion of a stone-covered pathway. Like we mentioned before, this is a unique way to save money without compromising the appearance of the walkway. Unlike the other wooden walkways, these stumps are above ground, quite large, and widespread, similar to rock stepping stones that you often see in gardens. As with the other two, this is also a less expensive option than buying flat stepping stone rocks (and it gives a more rustic appearance to the area). 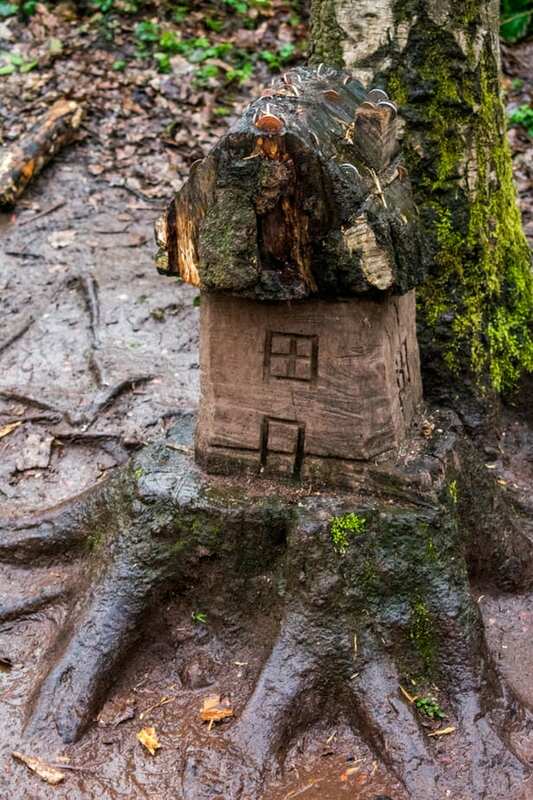 There are many ways in which you can use otherwise useless tree stumps. 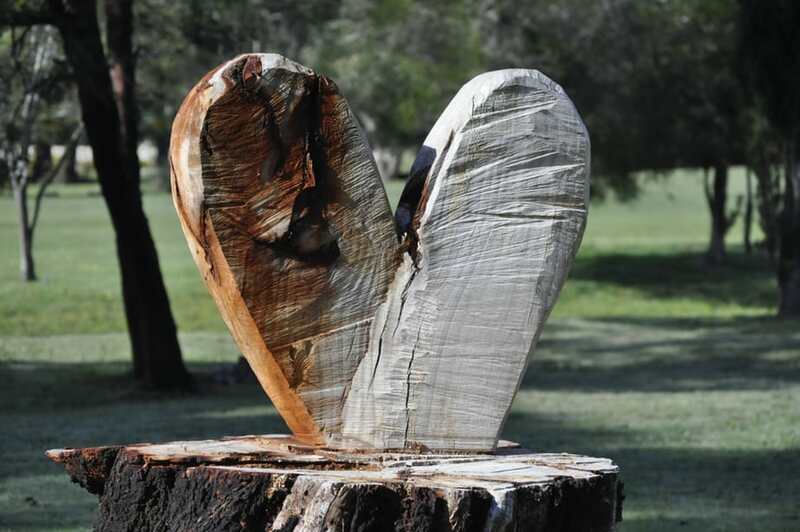 From holiday and wedding decor to seating areas and artistic works, there are endless possibilities for what you can do with a cut or fallen tree. 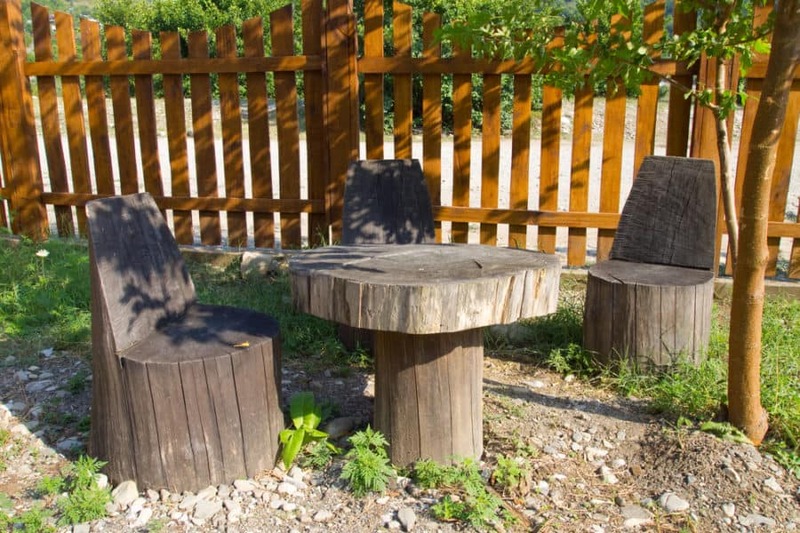 We hope this list of our favorite tree stump ideas gave you some ideas of your own to transform your home and yard!